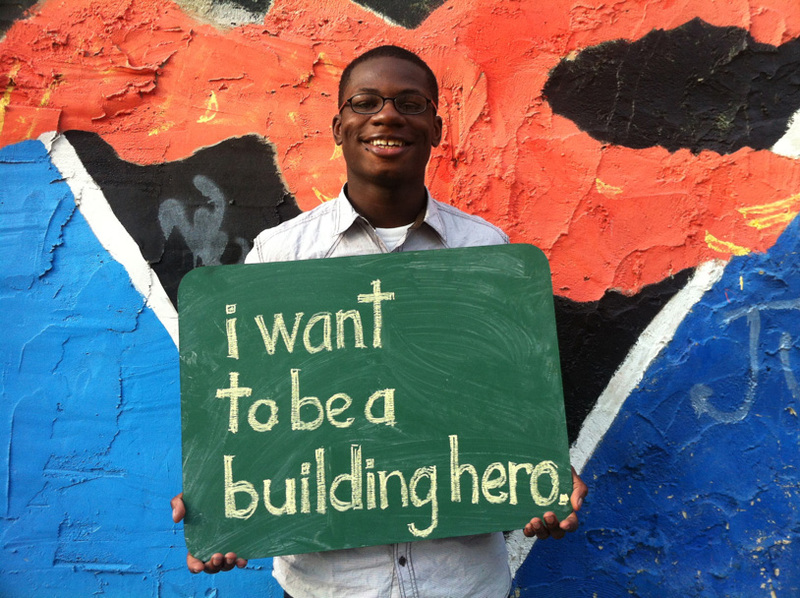 Tiny WPA is a program to redesign and rebuild Philadelphia’s schools, public spaces, and micro-infrastructure through design improvements initiated by youth. This program is inspired by the remarkable aspirations of Paul and RJ, two young adults from North Philadelphia. Blown away by the incredible community response they were getting simply by spending two hours rapid prototyping a bus shelter with me on a vacant lot on Germantown Avenue, they want to initiate a city-wide movement of community initiated civic design innovation. With the help of Paul, RJ, other neighborhood teens and a handful of young community-oriented designers, Tiny WPA will launch this Summer with the design-building of improvements to bus stops along Germantown Ave with our fantastic collaborators at the Village for Arts and Humanities. 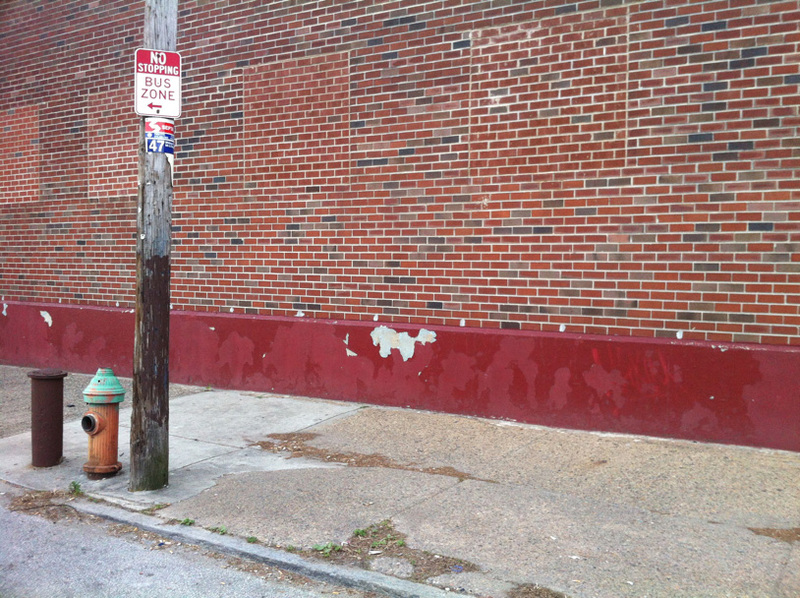 The larger need in Philadelphia is obvious for something like Tiny WPA that is empowering, inspiring, has demonstrable impact, creates a system for larger change, and is frankly, awesome. Why start with bus stops? On an immediate level, the Village—like many other arts organizations in the city—is the only provider of free after-school art programs to the 1500 teens who live in a 260-block service area. Due to this and the distribution of public schools, most youth ride buses to access services. In the spirit of the Safe Routes To School program, new bus stops strengthen partnering youth organizations and schools by creating recognizable place-making ‘markers’ for youth in a sea of nondescript bus stops. Simultaneously, bus stops provide an easy point of entry for consistently engaging a larger community and a highly visible stage for young adults to redefine possibility and grow a movement. And #TinyWPA is not just about building. In fact, the neighborhood engagement generated by the ‘making’ and ‘doing’ associated with creating these bus stop improvements place teens in the powerful position of being able to uniquely gather and distribute important civic data and information in their communities. To put it in the brilliant words of Story Bellows, one of our collaborators in the Mayor Nutter’s Office of New Urban Mechanics, we are also aiming to use #TinyWPA to transform teens into much needed Civic Data Sherpas for their communities. If the government doesn’t have the chutzpah to launch a WPA of CCC for the 21st century, we will. One of the most exciting aspects of Tiny WPA is its scalability. Tiny WPA provides a simple mechanism for training teens and young designers to work together to initiate change through design in their cities–this is an important missing element in the current love affair with kids, design thinking, and design for social good. We must take the time to grow the people and systems to fully realize the potential of the aforementioned ideas. Tiny WPA also has the potential as a deployable framework/collection of methods, recognizable branding and umbrella under which our collaborators, clients and friends in other cities can initiate similar change in their cities. 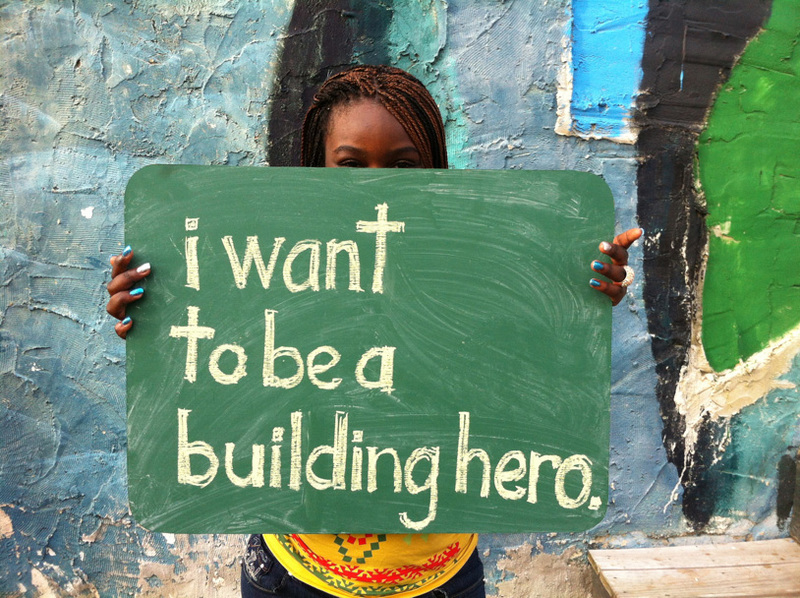 Would you like to be a Building Hero! like Paul and RJ? Would you like to get involved or help support Tiny WPA? Would you like us to bring Tiny WPA to your neighborhood, school, community or after-school organization? 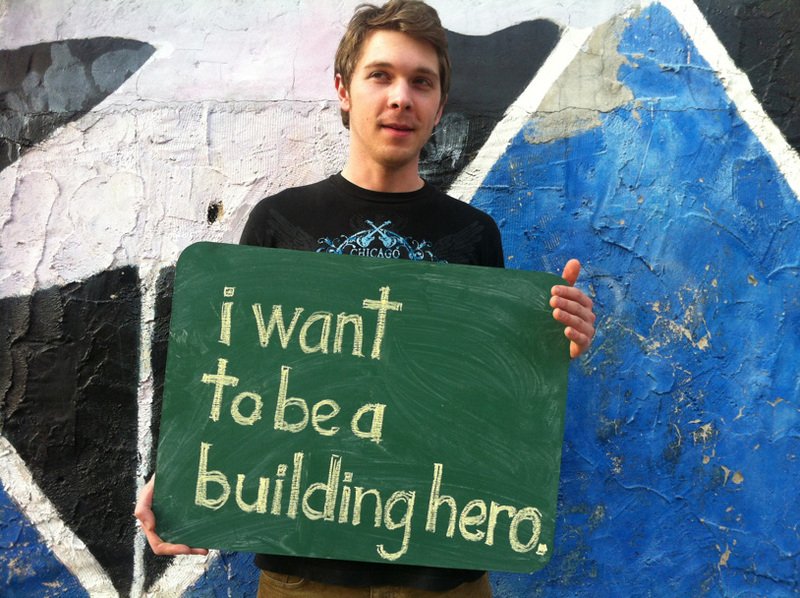 You want to buy an ‘I Am A Building Hero’ t-shirt to help support Tiny WPA awesomeness? Until we finish developing the TinyWPA website, you can stop by Public Workshop’s Facebook page for project updates and photographs. 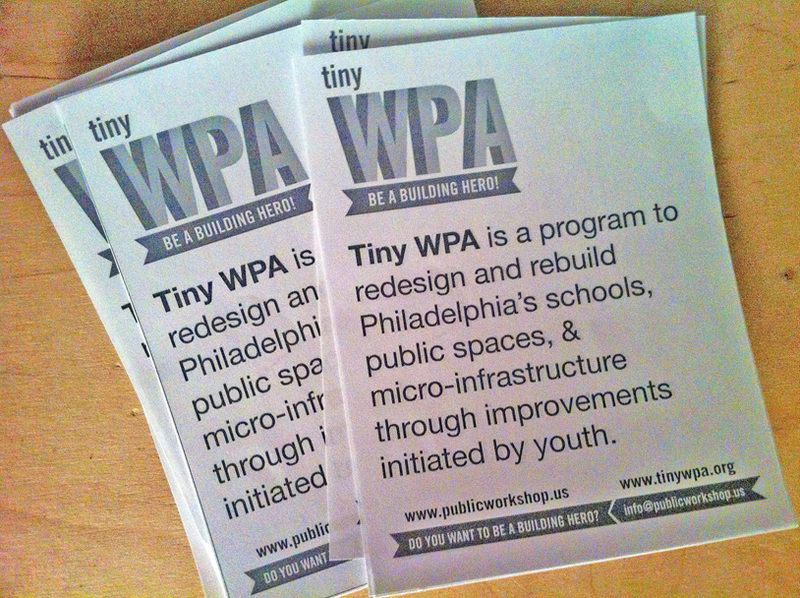 Tiny WPA was a finalist in StakePhilly‘s fantastic micro-grant program–thanks guys for a great event.